Not to be confused with Barbara Mandell. Barbara Ann Mandrell (born December 25, 1948) is an American country music singer, musician, and actress. She is known for a long series of country hits in the 1970s and 1980s as well as her own prime-time variety TV show on NBC that helped her become one of country's most successful female vocalists of that period. She gave her last concert at the Grand Ole Opry House on October 23, 1997. She then retired from performing music. Mandrell was inducted into the Country Music Hall of Fame in 2009. Although retired, Mandrell is still a member of the Grand Ole Opry; an honor she has held since 1972. Mandrell was the first performer to win the Country Music Association's "Entertainer of the Year" award twice (1980, 1981). She also won the Country Music Association's "Female Vocalist of the Year" in 1979 and 1981. Mandrell's first Billboard number-one hit was 1978's "Sleeping Single in a Double Bed", immediately followed by "(If Loving You Is Wrong) I Don't Want to Be Right" in early 1979. In 1980, "Years" also reached number one. She added one more chart topper in each of the next three years. "I Was Country When Country Wasn't Cool" (her signature song), then "'Till You're Gone" and "One of a Kind Pair of Fools"—all hit number one between 1981 and 1983, a period during which Mandrell also received numerous industry awards and accolades. Barbara Ann Mandrell was born on Christmas Day of 1948 to Mary Ellen (née McGill; born 1931) and Irby Matthew Mandrell (1924 – 2009) in Houston, Texas. Her mother was a homemaker and musician hailing from a large family in rural Wayne County, Illinois. Her father Irby was a World War II naval veteran and Texas police officer from Garland County, Arkansas. Irby Mandrell was an accomplished musician and entrepreneur as well. He used his impeccable social skills and knowledge of the music industry to manage all three of his daughters' careers for over 3 decades. Mandrell was an only child until July 13, 1954, when her sister Thelma Louise Mandrell was born. Baby sister Ellen Irlene Mandrell arrived 18 months after Louise on January 29, 1956. The eldest daughter of the musical family, Barbara Mandrell was already reading music and playing accordion when her sisters were infants. Six years later, she had become so adept at playing steel guitar that her father took her to a music trade convention in Chicago. While there, her talents caught the attention of RCA Records producer and session musician Chet Atkins and popular musician and bandleader Joe Maphis. Soon after, she became a featured performer in Maphis' Las Vegas nightclub show, followed by tours with Red Foley, Tex Ritter, and Johnny Cash. Her network TV debut came on the NBC-TV series Five Star Jubilee in 1961. While growing up, Mandrell learned to play the pedal steel and lap steel guitars and many other instruments, including the accordion, saxophone, and banjo. She played steel guitar for Patsy Cline, who once wrote to a friend that Mandrell was, "a 13-year-old blonde doll who plays the steel guitar out of this world! What a show woman!" Mandrell toured at age 13 with Cline, Johnny Cash, and George Jones. She also played guitar for Joe Maphis in Las Vegas and on the Town Hall Party show in Los Angeles. A few years later, Mandrell and her sisters Louise and Irlene, as well as her parents, founded the Mandrell Family Band. They toured across the United States and Asia. Their drummer, Ken Dudney, became Mandrell's husband shortly after graduating from Oceanside High School. Dudney received a commission in the Navy, serving as a pilot, and was sent overseas. Mandrell decided that she would become a country singer and moved to Nashville. Her father was then her manager, and with his help, she signed with Columbia Records in 1969. Over the next few years, Mandrell had a few minor hits. Her producer at the time was Billy Sherrill, known for producing other well-known singers in country music such as Tammy Wynette, Charlie Rich, and Tanya Tucker. Within 48 hours of a nightclub appearance near the Grand Ole Opry, she received offers for recording contracts from six record companies. After signing with Columbia in 1969, she notched her first chart hit, a remake of the Otis Redding classic "I've Been Loving You Too Long". In 1970, Mandrell scored the first of many top-40 hits with "Playin' Around With Love". In the same year, she began performing with singer David Houston, and their partnership also generated considerable chart success. Mandrell's first releases earned respect from her country peers, but her first big breakthrough with fans came in 1973 with the single "The Midnight Oil"; it was the first song sung from the perspective of the woman who is doing the cheating, which at the time was unheard of. While with Columbia Records, Mandrell worked with legendary country producer Billy Sherrill. Under Sherrill's direction, Mandrell recorded country-soul material, which never gained her widespread success. Her early hits included 1970s "After Closing Time" (a duet with David Houston) and 1971's "Tonight My Baby's Comin' Home", "Treat Him Right", and her version of Joe Tex's "Show Me." Her records did not generate high sales on the Columbia label. Sherrill later said in the book, How Nashville Became Music City, that he was asked every year by the other Columbia executives, why he was keeping Mandrell, because she was not selling records. Sherrill kept Mandrell with the label until 1975. In 1975, Mandrell jumped to the ABC/Dot label, and under the guidance of producer Tom Collins, reached the top five for the first time with the single "Standing Room Only". After a series of successive hits, she scored her second number one with 1978's "Sleeping Single in a Double Bed", immediately followed by another chart-topper, "(If Loving You Is Wrong) I Don't Want to Be Right" in early 1979. "If Loving You Is Wrong" was also a major crossover smash, becoming Mandrell's only single to reach the top 40 on the pop chart, peaking at number 31. The song also peaked in the top 10 on adult contemporary radio stations. During the 1980s, Mandrell had more hits, including "Crackers" and "Wish You Were Here". All of these singles and more reached the country top 10 and some also hit number one, including "Years". Three more singles hit number one: "I Was Country When Country Wasn't Cool", "'Till You're Gone", and "One of a Kind, Pair of Fools", between 1981 and 1983, a period during which Mandrell also received many industry awards and accolades. "I Was Country When Country Wasn't Cool" is one of Mandrell's best-known songs. The best-known version is the live version featuring George Jones. In 1983, she won a Grammy award for "Best Inspirational Performance" for the song, "He Set My Life to Music". In 1980, Mandrell became the third woman to win the "Entertainer of the Year" award from the Country Music Association. She repeated in 1981 by winning the award for the second time. This was unprecedented, as prior to her, it was presumed, that it only went to an artist once, but she nabbed it a second year in a row with her non-stop touring, hit records, and popular TV show. This began the huge array of awards and she would win: several CMA, ACM, and MCN awards, seven American Music Awards, and nine People's Choice, making her one of the most awarded country acts in history. A collection of duets with Lee Greenwood, Meant for Each Other, followed in 1984. From this album, Greenwood and Mandrell had two hits on the country chart spanning 1984 and 1985, including the top-five hit, "To Me", and the top-20 "It Should Have Been Love by Now". Also in 1984, she opened a fan-based attraction across from the old location of the Country Music Hall of Fame in the heart of Music Row in Nashville called Barbara Mandrell Country, a museum about her life and career. While Mandrell was at the peak of her popularity, she had a major setback when she was involved in a serious automobile crash on September 11, 1984. According to Toni Reinhold in Redbook, the singer "sustained multiple fractures in her right leg, including a broken thigh bone, knee, and ankle. She also suffered lacerations and abrasions and a severe concussion that caused temporary memory loss, confusion, and speech difficulties." After a year and a half of rehabilitation, she recovered and returned to recording and performing. Mandrell told interviewers that the crash made her reassess her priorities. In October 1997, she retired from performing and touring. Mandrell now spends her time gardening, painting, and caring for her family and many pets. Mandrell is now a confirmed seat belt advocate, especially because prior to the crash, neither she nor her two oldest children Matthew and Jaime (also involved in the crash) were normally seat belt wearers. Mandrell saw a station wagon in front of her with the tailgate down and children not being restrained in the back, and felt the need to tell her children to buckle up just before the crash. During the recuperation period, Mandrell was unable to work, so she needed to collect on her insurance to pay for medical bills and to keep her touring band paid. On the Ralph Emery on the Record show, Mandrell explained that the problem was that, under Tennessee law, she had to go through the formality of filing a lawsuit against survivors of the dead driver who had caused the accident, 19-year-old college student Mark White, to collect from her own insurance company. Mandrell further stated that she instructed for her attorneys to phone White’s family and tell them that she wanted no money from them and was only taking such action to get her own insurance company to pay for her medical costs, but most fans never knew about that or about Tennessee's insurance law. They saw only the headlines about the lawsuit against the family who had lost a son. Before the case went to trial, she adds, her insurance company filed for bankruptcy. Her record and ticket sales fell off “in a big way,” Mandrell says. Mandrell's career recovered in the mid-1980s and, despite the neotraditional country boom and an overall loss in interest in country-pop artists during that period, continued to chart top-40 country hits consistently until 1989. Her last top-10 hit was a cover version of the 1960 song "I Wish I Could Fall in Love Today," which peaked at number 5 on the country charts; her last top-40 country hit, "My Train of Thought," peaked at number 19. Subsequent albums and singles failed to chart as country music largely abandoned many established stars in favor of newer acts in the early 1990s. In 1980, the TV program Barbara Mandrell and the Mandrell Sisters premiered on NBC. In addition to hosts Barbara, Louise, and Irlene, the show featured musical guests and comedy sketches. Each broadcast also closed with a gospel song, which led to Mandrell recording her own inspirational album, He Set My Life to Music (1982). As a result of her busy schedule, she began suffering from vocal strain, and on doctor's orders, pulled the plug on the television program in 1982. (Variety shows were also falling out of favor at the time; the series was NBC's last variety series to date.) She received one award (People's Choice) and two nominations (Golden Globe and TV Land Award) for her work on the show. In 1983, she premiered The Lady Is a Champ, a Las Vegas stage show. Mandrell had the starring role in Burning Rage alongside Tom Wopat in 1984 just prior to her car accident. Later, she also had guest-star roles on hit shows, including: Touched By An Angel, Empty Nest, Diagnosis: Murder, Dr. Quinn, Medicine Woman, The Commish, Baywatch, Walker, Texas Ranger, and Rockford Files. She also had a recurring role in the late 1990s on Aaron Spelling's daytime drama, Sunset Beach. Spelling was a big fan of hers and wanted to incorporate her into one of his shows. Many of these performances can be seen on late-night television or on the DVD box sets of the respective shows. In 1990, she wrote an autobiography called Get to the Heart: My Story, which was a New York Times bestseller for more than three months, and in 1997 became a highly rated CBS TV movie of the week starring Maureen McCormick. 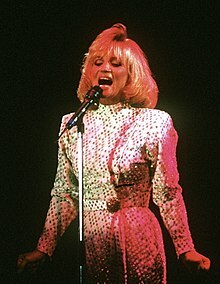 Mandrell promoted her autobiography on shows such as Sally Jessy Raphaël, Geraldo, and The Oprah Winfrey Show, with whom she shared the "Woman of the World" honor in 1992. In primetime, she appeared on The Tonight Show Starring Johnny Carson and Ralph Emery's Nashville Now, and she even "rapped" during one of her three Arsenio visits. Barbara Mandrell married Ken Dudney on May 28, 1967. Dudney had been the drummer in the Mandrell Family Band. Mandrell and Dudney have three children, Kenneth Matthew Dudney (b. 1970), Jaime Nicole Dudney (b. 1976), and Nathaniel Mandrell Dudney (b. 1985). Mandrell's oldest son Kenneth "Matthew" Dudney is a gourmet chef, who has worked in the Nashville area for many years. After overcoming several bouts of alcoholism, Matthew married Christian recording artist Christy Sutherland. He now travels with her as her personal manager. Mandrell's daughter, Jaime, was Miss Tennessee Teen USA 1993 and placed in the semifinals at Miss Teen USA 1993. Jaime was Miss Golden Globe in 1996, following a tradition, where one son and one daughter of famous parents present the Golden statues. Following this, Jaime played her aunt, Irlene Mandrell, in Get to the Heart (The Barbara Mandrell Story), and was seen on the long-running CBS daytime drama, As the World Turns, from June 1998 to January 2000. On December 23, 2012, Jamie married Whit Gilbert. Mandrell's youngest son, Nathan, married Hannah Menefee on March 8, 2012. Both met while attending the University of Mississippi. Nathan is the Vice President of Sales and Marketing for Dynamic Research Technologies. Hannah received her medical degree from the University of Tennessee in 2014 and accepted an internship for obstetrics and gynecology at Vanderbilt University. ^ a b c d e f g h i "CMT.com : Barbara Mandrell : Biography" (bio page), Country Music Television, Inc., 2008, webpage: CMT-BMandrell Archived 2008-01-16 at the Wayback Machine. ^ "Barbara Mandrell Says Goodbye - Today in Country Music History". klaw.com. Retrieved January 19, 2019. ^ a b "CMT.com News : 20 Questions With Barbara Mandrell" (interview), Country Music Television, Inc., October 2006, webpage: CMT-BMandrell-20Q Archived 2009-02-10 at the Wayback Machine: interview, quoted "That is my signature song ['I Was Country..']... The next thing I knew, they had written for me 'I Was Country when Country Wasn't Cool'. It's literally the story of my life..."
^ "Barbara Mandrell: Sweetness Through Suffering". Cbn.com. 2001-09-11. Archived from the original on 2016-09-27. Retrieved 2016-10-15. ^ Mandrell, Barbara. "Mandrell Injured in Auto Accident". NY Times. Archived from the original on 19 April 2015. Retrieved 9 April 2015. ^ "Country Music – Music News, New Songs, Videos, Music Shows and Playlists from CMT". www.cmt.com. Archived from the original on 13 October 2012. Retrieved 8 May 2018. ^ Dudney, Jaime. "Dudney and Gilbert Marry". Site Mason. Archived from the original on 3 September 2014. Retrieved 28 August 2014. ^ "News". Sitemason.com. 2015-01-20. Archived from the original on 2015-09-24. Retrieved 2016-10-15. ^ Dudney, Nathan. "Dudney promoted to VP of Sales and Marketing for DRT". DRT. Archived from the original on 3 September 2014. Retrieved 28 August 2014. ^ Menefee, Hannah. "Hannah Menefee Dudney Interns for Vanderbuilt". Barbara Mandrell. Archived from the original on 12 October 2014. Retrieved 28 August 2014. ^ Duke, Jan. "Fontanel Mansion: Exploring the Fontanel Mansion & Farm". About.com. Archived from the original on September 7, 2015. Retrieved September 3, 2015. ^ "Let's Catch Up: July 26, 2017". barbara-mandrell.com. Retrieved February 12, 2019. "Sleeping Single in a Double Bed"
"Only a Lonely Heart Knows"
"There's No Love in Tennessee"
"Fast Lanes and Country Roads"
"No One Mends a Broken Heart Like You"
"I Wish That I Could Fall in Love Today"
This page was last edited on 23 March 2019, at 19:09 (UTC).